Record the condition of the property to safeguard your security deposit. The process of moving into a new house/apartment can be very exhausting, which is why the last thing on your mind is the actual day you move out, but since your landlord has been holding onto a considerable chunk of your money (security deposit), it’s risky not to prepare for the end of your tenancy right when you move in. So, before you start unpacking your dishes, clothes etc. take a few simple precautionary steps to avoid future misunderstandings and disagreements over the security deposit. Before moving in, be sure to give your new home a thorough inspection. (Better yet, do it before you sign the lease!) You should inspect the premises before you move in because it’s easiest to spot problems while the place is still empty. Go over the place from top to bottom over for damage such as dirt, mildew, and obvious wear and tear. Don’t forget to check out things that might not be readily apparent, like water pressure and sink drainage, appliances, the appearance of floors and walls, and the state of the pads under the carpet. You should make a detailed list of what you find. An easy way to do this is with a strong checklist. The more details you provide about the unit when you move in, the better position you’ll be in when moving out to prove that certain problems were already prevalent before you moved in. In some states (see below), landlords are required to deliver new tenants a written statement on the condition of the premises at move-in time, including a complete list of all existing damage. Whether it’s required by the law or not, many landlords will still provide a checklist to new tenants, but not all will. So, to be careful, you should either write up your own checklist or you can check out our article Security Deposit Checklist. It would be ideal if you fill out the checklist together to prevent any future disputes or disagreements. It’s also smart to bring roommate or a friend so there’s a witness to the conditions of the unit at move-in time. If you see problems, describe in detail what exactly is wrong. Rather than simply saying, “damage to wall,” for example, you should say “chipped paint, molding, and 2 holes on the bathroom wall.” The more precise you are, the easier it is to prove you’re not responsible for those particular damages. Both you and your landlord should sign the checklist after completion; then make a copy so each of you has one. At the end of your lease, you should make another inspection of all the same items, stating their condition at move-out time. If certain items that were okay at move-in are now damaged, your landlord could hold you responsible for fixing them, but you’ll still be protected from being billed for any damage that existed before your lease started. Along with filling out a checklist, it’s also a smart idea to document the condition of your unit with photographs or videos. Just make sure you print out two sets of photos and give one set to your landlord. Then each of you should date and sign both sets of photos. If you make a video, make sure you clearly state the time and date when the video was recorded and send your landlord a copy. This process should be repeated when moving out. 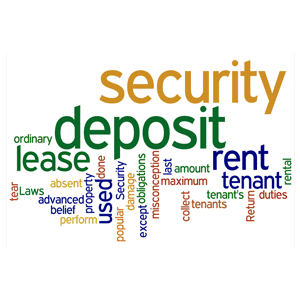 Contact a Miami Landlord Tenant Lawyer if you need help retrieving your security deposit.